My daughter has been bullied from preschool to third grade and there was little I could do as a mom. I spoke with her teachers repeatedly and they just did not do much. After speaking with the principal, the bullying stopped. The principal actually went directly to my daughter’s classroom after speaking with me and spoke to the students about being kind and that bullying is not acceptable. I am very thankful that we have such a proactive principal. After this experience, I had to let the school board know the sequence of events and decided to email all the school board members and the principal. I did not even know how to contact the school board members, but kept at it and finally found the information. I wrote an email to all the board members and the principal complimenting the principal and letting them know I feel safe sending my children to school. After sending out emails and talking with various parents about my experience, I decided to email the school board members and the principal at the end of each school year. Since my children receive report cards, I thought it is fitting that the school board members and the principal should get one too. This is a tradition I hope to continue throughout my children’s education in LAUSD. 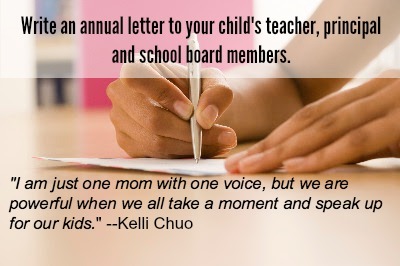 I am just one mom with one voice, but we are powerful when we all take a moment and speak up for our kids. Thank you to PALs for inspiring me to continue to be a voice for my kids and learn more about the choices for my children’s education.